Ok so steam did not like me and did not work for me even with running as admin. I found a windows 10 workaround. Apparently it has some game features hidden away, if you press the windows key + G you get the game bar which will let you take screenshots and also video if you have a supported graphics card. A shortcut for taking screenshots is window key + PrntScr. This works in cutscenes so far, and hopefully works in flashpoints as well. The pictures appear to be uncompressed or at least more uncompressed than what I get from just print screen. Check my profile for links my short story and art work threads. New to RPing? Check my Getting Started Guide. 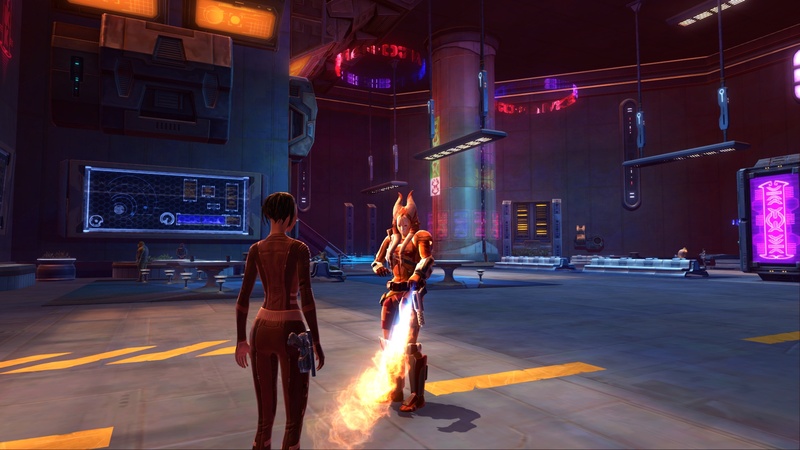 This is Imazi's post KOTFE armor, she didn't wear heavy armor before Zakuul arrived but it seemed prudent after. She's still rocking orange though. This is an OOC outfit now, but this was originally supposed to be Jessak's vigilante gear for her "Princess" persona. That part of her character never materialized as she ended up developing in a different direction, but this is still the outfit I run about town in. She has a matching neon green mount to go with it. Gosh, Karmic has so many. I'll have to go through and see about putting together some of her more "signature" looks she likes to wear for certain things. I love this. Really wish something like that was in game. I'm trying to do a new outfit for my main but I can't find a helmet or mask that satisfies me. All the ones I could find that looked half decent are unobtainable and will likely stay that way forever, any suggestions? Is that top from a Revanite set? I have the Pursuer's set, but I wouldn't mind getting one of the "fancier" ones...too bad they're so damn pricey. 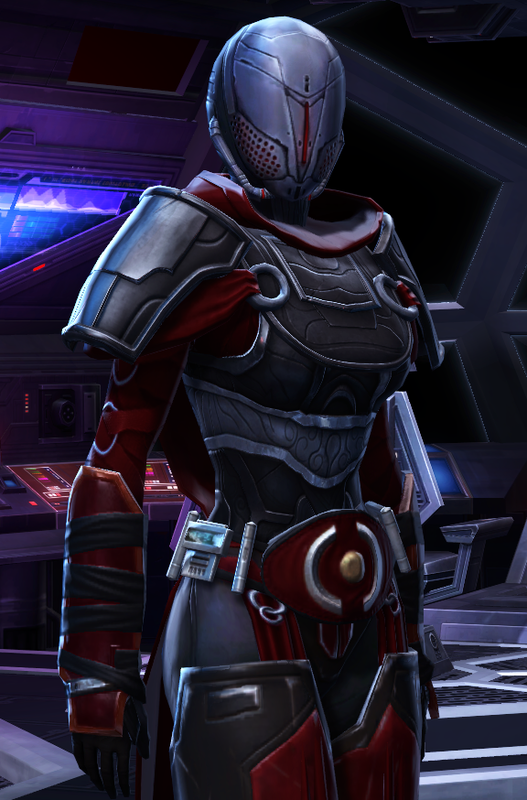 It's the level 60 ultimate commendation chestplate for Sith Warriors dyed red and black. I never did ops enough to get any more than this but I wish I did because the hats were all so nice and would have been perfect. What are you looking for in a mask or helmet? Hopefully a hollow space big enough to fit her head inside of. 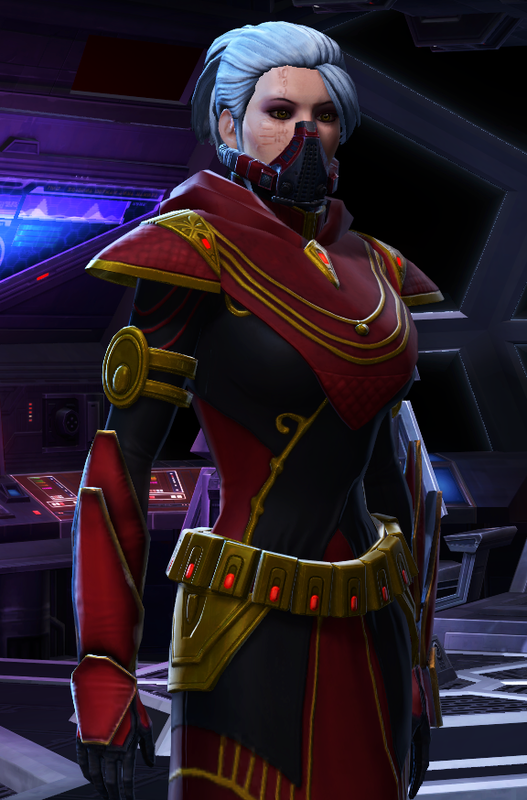 Also here's a picture of my pro-Republic Sith, her outfit was inspired by a coat I bought that was too small but looked kind of nice anyway. @SquigglyV, I can offer you the snowtrooper helmet, Overwatch Enforcer Helmet's, Battleworn Engineer's Headear, Skiff Guard Helmet for free. I have extras. Here's more outfits. I'm using spoiler tags to break things up just in case it's enough pics to make the page take longer loading. Jessak's Wedding Dress: Not that Jessak is much of the type o get married, but back when the outfit designer came out I did throw together a wedding outfit. Now that I've taken pictures of it can use that slot for another outfit. Blue Gown: This was the first time I used the sensuous dress top with a color other than the red it came in. Clockwork Gown: This was the gown Jessak wore for the clockwork events. In the bright light the skirt no longer looks comparable in color to the top, but normally they match better. The nice part is that the light brown looks like Jessak's skin in the back which is the way I actually RP the outfit. Only the red and gold parts of the top are supposed to be the dress, the brown is supposed to be bare skin. Various Skirt Sets: If it looks like fur on Jessak, it's real fur. However, Jessak also has casual skirt outfits as well. Hmm... she ends up in a lot of brown skirts doesn't she? Vacation Clothes: Not that Jessak makes it a habit to go to cold places but she does have a parka just in case, nobody tell her that in a whiteout someone could lose her in that white outfit. Poolside at the Roze Garden, or anywhere else, Jessak is also ready for some fun... as long as the water isn't blue. Nonetheless, she is also ready for a party in a drier locale in her festive looking blue and orange outfit. Corporate Uniform: This is Jessak's corporate uniform sporting the Roze Industries colors. Black, Red, Brown Outfit: not a whole lot to say about this one except that it was an attempt to work with the unchangeable tertiary colors in the top. The browns didn't quite match. 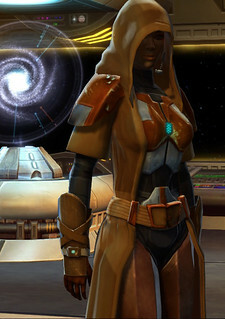 Tough Girl Outfit: This is the outfit Jessak wears when she wants to look tougher than an angry gizka. Hot Pants: This is Jessak's "cute outfit". This is the one that started Zenchi teasing her about her tight pants and caught her boyfriend's attention. 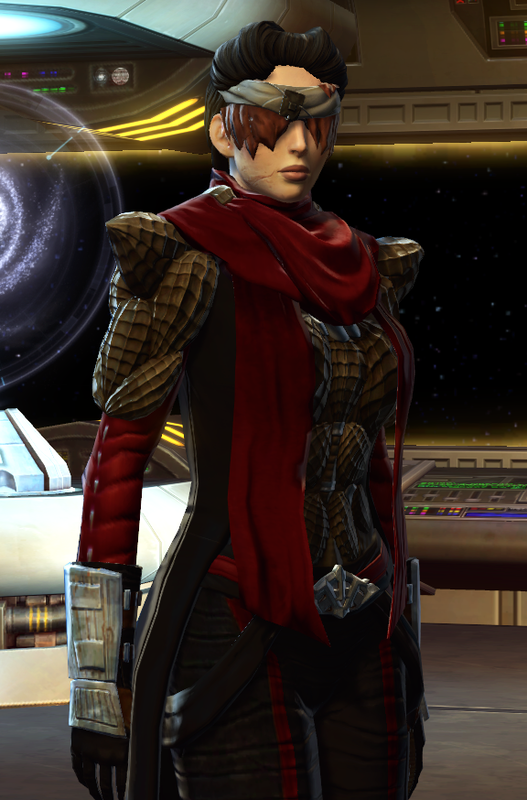 Cartel Enforcer: This is a recreation of Imp!Jessak's OOC mission running outfit. 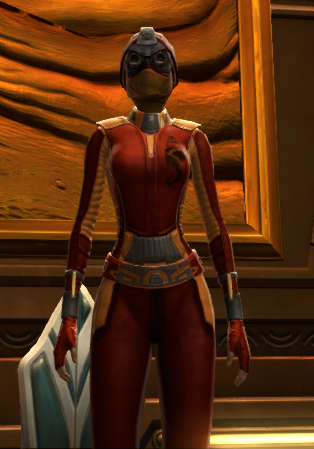 Since I lacked the pieces necessary to recreate the Princess outfit Impside, I decided to make her look like a Hutt Cartel Agent on special loan to the Empire. 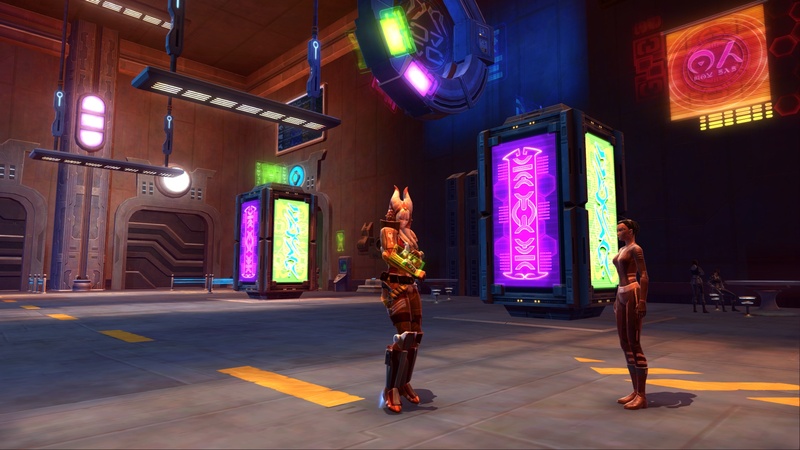 Seenine Through the Years: This is Pre-KOTFE C9, Post-KOTFE C9, and Post-KOTFE C9 in her Wedding Skirt. Difficult Creator Organic insisted that she be properly dressed at weddings so he made her a skirt to wear. He did that pre-KOTFE though. I just impulse bought this set and unlocked it in collections, so far I don't regret a thing. I wonder if Phayri would look better with a different hair colour though. As for the hat to that other outfit, I think i'll just go with a generic breathing mask unless something better shows up. But if anyone finds a Revanite Avenger helmet let me know because i'll totes buy it. Also look at this gold lightsaber I found. It matches her outfit. Some new armor for Urziya! So google lead me to pinterest lead me to tumblr. Long story short some people have some awesome ideas for Star Wars fashions. 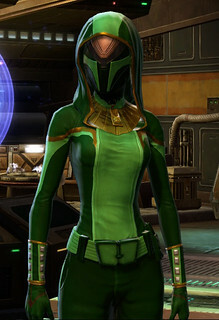 This is nice female chiss Regal wear. The Constellation crown is a neat touch. This is a set of female Zakbrak outfirts. The shawls are really nice. In fact, this person's pinterest board is just loaded with awesome outfits and awesome art. Lots of chiss art too.